Nine of Pentacles says you will experience mental, emotional, spiritual, physical and financial profit if you choose to follow what has heart and meaning to you. Organize your life and the results will be gain, which comes as a result of unifying your wisdom with your love in a creative way which facilitates tangible gain in all areas of your life. Recognize that you feel incomplete only because you are still seeking goals, a purpose – “inner” satisfaction. Continue to seek what you have not found and you will succeed. Complete the “work” of your self-development – have confidence in your self-discipline and patience. You are in harmony with nature around you and everything will bear its fruit in time. You are not alone now. Turn within yourself to reap the rewards of self-development. Experience your self awareness – distinguish what matters in life and what goals truly demand your best efforts. Experience the sense of certainty that comes with knowing you have made the right choices and followed them with the necessary actions – for this produces a life that is productive and alive. Success in “creating” yourself out of the material given you by the circumstances and conditions of your life – the ability to KNOW when others only guess. Follow your goal to the end and do not allow impatience to get in the way. Materialize, manifest and realize your dreams. Harvest the fruits of your labors and prepare to plant again. Certainty is the mark of a truly evolved person and to achieve this you have been required to give up normal companionship in order to achieve self – reliance, producing a certain loneliness in the pursuit of your goals. You have had to give up spontaneity, recklessness and wandering. If the sacrifice “appears” too great – perhaps you do not value enough the rewards of your self – development. True discipline never cripples – it allows one to soar. You will work hard to satisfy the goals of your mind as it stretches to accommodate the universal mind. In so doing mind insists that the planes align themselves, first within themselves and then with each other. There is security of position and the ability to appreciate the benefits of good health and material success. If you so desire, a life of active leisure is possible as your personal garden of Eden is all around you. Physical well-being is protected by the power of your mind and that power is available to help others. Physical healing is possible here as an adjunct of your ability to achieve and maintain order in your Physical Plane. The conventional avenues of medicine are more common here, but other alternatives apply as well. There is good integration of your physical needs with the environment (on all levels – plant, animals and other people). There is great appreciation of nature, your actions can benefit and bring increase in the world system. Physical evidence of the work of the intellect in the form of knowledge storage. How do you give thanks for all that you’ve gained? Three Swords in spread: Keep a tight reign on your expenses – this is not the time for careless spending. Next to Emperor: There may be an opportunity for a new position of responsibility which will mean an increase in finances – take time to consider the added duties. Three Tens and World in spread: A major move or long vacation that will be very worthwhile. In the first position: The highest application of mind to practical purposes, generating greater efficiency and comfort in life for self and others. The ability to match people and their environments – the mark of the designer, in particular the industrial designer, the civil engineer and the architect. The humanitarian scientist, the grass roots politician, the pragmatic inventor all make an appearance here. In the second position: You have all the physical resources you need to achieve anything you want to achieve. In the third position: Look around – things should be turning out the way you would have them – but, maybe you have not realized it yet. In the fourth position: The legend of Johnny Appleseed in a love affair with trees. St. Francis of Assissi in his love for animals. The passion here is for the garden that is the earth itself, for a true garden is that which sustains us to be ourselves. In the fifth position: You are very aware that you have everything you need at hand to complete your master plan. It really is up to you. There are no excuses now. You have all the pieces and need only to assemble the puzzle. In the sixth position: What seems so perfect for you, may or may not be for others. In the seventh position: Your challenge is to use your resources to produce more, rather than to luxuriate in and consume irresponsibly. It is a blessing to have all that you need to survive and be comfortable in the process, for it allots you the time others less fortunate do not have. 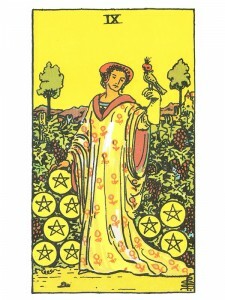 In the eighth position: One certainly hopes that you are enjoying the blessings of such bounty for your karmic purpose. In the ninth position: You are energized by your fortunate circumstances and wish only to share you experiences and your pleasure with others. In the tenth position: This archetype addresses the eternal question whether man is innately lazy or industrious. Would we be working if we had not been thrown out of the garden of Eden? The presumption in perennial philosophy and thus in the Tarot is that of course we are naturally industrious, ever seeking the productive fulfillment of our karmic purpose. Tend to the needs of your garden. Maintenance will preserve and magnify the beauty of what you already have. I believe this is in reference to the resources available to you in the physical plain. Finances, materials, assistance, etc. What are physical resource? Body related? I really enjoy and appreciate the tarot cards reading which is amazingly spot on. I don’t even need to ask but in my thoughts and as if God send, answer to my thoughts. Thank you. Thank you for your support, I hope the site is useful as well.